I promised you a post about the so-called brown furniture today as it has been mentioned a couple of times as an important trend for 2019, so I thought it would be good to have a little look at why that might be and why you should considering bringing it into your own homes. Everything is cyclical of course and there was a time – actually since the 1970s – when antiques, as they used to be called before the rather derogatory name of brown furniture was coined, were regarded as old fashioned and dull. Or, more damning – belonging to your parents. It was the age of plastic and space age, modern G-plan and Scandinavian furniture which was, crucially, lighter and made from pale wood. Those of us who had grown up in dark period houses filled with dark heavy – mostly Victorian – furniture rejected this look for something light and modern. We also hated the thin and spindly furniture that was overly ornate and seemed to collapse at the touch of a coffee cup – not to mention the marks. “Use a mat,” was one of the most common refrains in my Grandmother’s house where I grew up. But the wheel has spun round and suddenly it’s fashionable again. So let’s have a look at 10 reasons why you need to bring brown furniture into your home. 1 Your home should tell your story. A piece of furniture that has been passed down to you will do that. But even if it belonged to someone else’s Granny rather than yours, it will still have a story to tell though the wearing of the wood, the dents and the scratches. It just has more character and who doesn’t want that in their home? 2 Antique wood has a depth of colour and patina to it that you just can’t recreate with modern wood. It’s great for warming up grey rooms which can look a little cold in our blue northern hemisphere light. 4 It is often better made than modern equivalents – it’s already lasted this long after all. 5 An old piece of furniture is perfect in a newly built, or decorated room. The key to creating a successful interior scheme is making something that looks so right that it looks like it has always been there. A vintage chair or stool can bring that story to life. 6 A vintage stool in a bathroom, or a vintage dining table in the kitchen is a beautiful counterpoint to all the hard edges, straight lines and, well, modernity, of those spaces. 7 Many interior designers believe that vintage chairs have a better rake (angle of the back) than modern ones and are therefore more comfortable. 8 A modern house looks great with some period furniture just as an old house will showcase modern furniture – you don’t have to match the two. 9 An old Persian rug will soften an industrial concrete floor, or hide some rustic floorboards. Plus you can spill anything on it and it won’t show. 10 You can still pick up great bargains on ebay and carboot sales and junk shops. Yes, the big names and collectable stuff is expensive but you don’t need to buy that – unless you want to. So there we have it. What do you think? Antiques love ’em or hate ’em? Tell us your stories below. but we professionally and traditionally restore them to a high standard. This is the look our younger clients like as it is a very clean but also well built piece of usable furniture and in a simple background like white painted walls, brown antique furniture can look amazing. You really can not get better value for money as these pieces were built to last and even after over 100 years they are still solid pieces that will last for 100s of years more! I’m not a designer but I read a lot of interiors blogs and magazines and I wasn’t particularly aware that ‘brown*’ furniture was out of fashion. I am aware that what people don’t like now is the sort of home that looks like it was put together during one trip to IKEA/ Habitat/Heals. The sort of look you see in a property development show home. Which is why I think so many of the contributors here have antique furniture and love it. And why if you open any interiors magazine the houses will usually feature something old. As Kate says, old furniture tells a story and shows the owner has taken time to create a unique home. I’ve loved reading the other contributions about where old furniture has come from and why it is loved. Have recently bought a Spanish mahogany round breakfast table ( 1760) for my new modern kitchen. I have new plastic chairs around it. I use a waxed tablecloth when the grandkids come over. I would definitely encouraged others to add a bit of something old. Its the ultimate in recycling. Every room should have a piece either handed down or bought. Too much dark wood can be oppressive and Victorian stuff can be particularly heavy and too ornate. Georgian furniture is my favourite. It can also be much cheaper than modern stuff so well worth sourcing. I manages to find a lovely old mahogany table with rope edge carving and brass claws on the legs in a thrift shop for £70 as I was renovating on a budget – It just about works with the modern Ikea chairs but I am in a bit of a design crisis as if I renovate again and go for modernist/minimalist will I be able to still use my lovely table! you love what you love, and family affiliation to the piece is so poignant that why would you discard it for a trend? I love antiques, always have done. I couldn’t bear the idea of my grandmother’s dining table and chairs, a present from her own parents when she got married, being tossed out when she moved so I took them on and the table sits in my tiny living room beautifully. Admittedly the many leaves are stuffed under the sofa but I don’t care about that! I have a beautiful linen press squeezed into the spare bedroom to set off the blue walls and modern furnishings, and I have lovely delicate chairs, also from my grandmother, in each of the bedrooms. More recent additions such as our kitchen table, although more antique pine and a little rustic than a fine antique, are also welcomed in our home. I never really understood why “brown furniture” went out of fashion, it always seems to add such a lovely touch to a room (and I consider myself “relatively” young so I don’t consider it an age thing). Anyway, hurrah that my interiors could be considered vaguely in fashion! 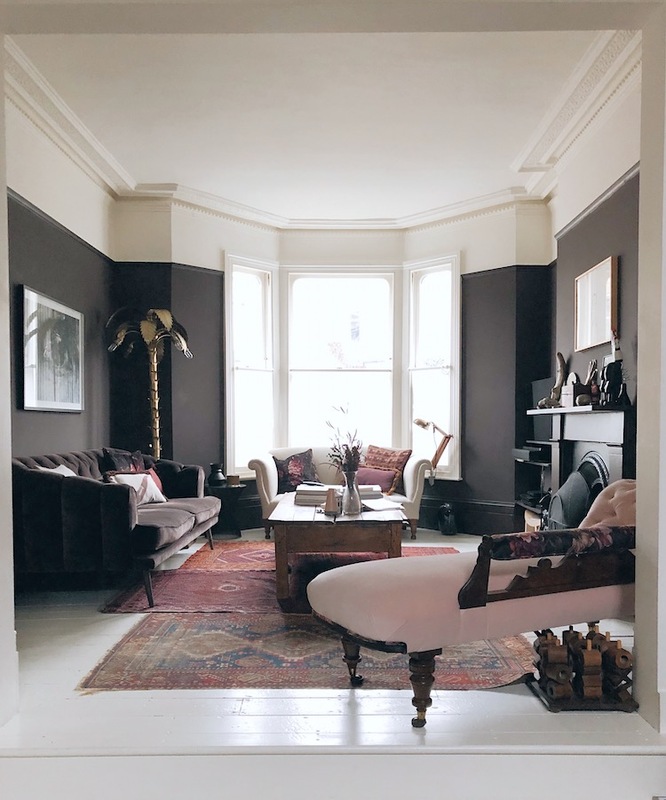 I love the mix of antiques and contemporary pieces, living in a victorian terrance house means that I am constantly balancing the mix of traditional period features with modernity. I think this is the modern aesthetic and how you put it together is what makes it unique to you. I don’t think this is anything particularly new. I hate the term ‘brown furniture’ though, its very basic and doesn’t really describe much. It seems to me that you are describing a resurgence in a more ornate, heavier style of antique furniture which has perhaps been neglected for sometime. May be more Victorian and a bit fancier? However, I would argue that simpler eras of antique furniture never really went away. Alice says a “good book” instead of a coaster. Well I search out small and medium sized hard back books (usually with dreadfully boring stories) with embellished spines and covers and place them under pot plants that sit on antiques pieces of furniture so they are not marked. Looks good too! What a great idea, Anna. I dislike coasters under pot plants. I’ll be adopting your method. I have a couple of antique pieces which are just beautiful and I will NEVER get rid of regardless of trends. One is a Georgian inlaid Welsh linen press. It’s the best thing in our house. good furniture should be for life. My house is a mix of Ikea, and “brown” furniture. I have a lot of my grandparent’s pieces and love that I’ve known these pieces of furniture all my life. My parents used to drag me and my brother around junk and antique shops, which I hated at the time, but found myself doing the same to my own children! As well as my grandparent’s old bits, I’ve also collected other pieces over the years, either from secondhand and charity shops, or via Freecycle and Ebay. They not only look good, they’re cheap and well made. With the beige walls and now brown furniture, it seems that Eastern European interiors are the new trend. Great to see so much love for ‘brown’ furniture in the comments. There are such a broad range of styles and colours of woods available, and as you say it is greener, cheaper, better made, and often has a lot more character than modern furniture does. Also it can be a real pleasure sourcing pieces, either through online sites such as eBay or Saleroom or attending fairs or auctions. I think brown furniture never really went away – your home is a good example. The pieces you feature in your photos above are not new to your interior design scheme. I’ve always loved that chair in your bathroom! If one looks a bit more widely on Instagram than the “insta famous” designers whose names come up all the time, there are plenty of established designers who adopt current trends while still using antique furniture. I recently found a Restoration chest with beautiful carving and an almost black patina for less than the price of a modern coffee table. It was cheap because the internal till (the removable shelf) was missing. Since it has a lamp on top of it I wasn’t bothered about that! Amazing to think it has been around since the time of Charles II. I have a few pieces of brown furniture and agree that the quality is hard to beat. I like just one piece of old furniture per room, with everything else light and bright. An old chest of drawers or table becomes a statement piece that draws the eye. So glad it’s coming back into fashion. I have lots of antiques and vintage furniture, and when we renovated some historic apartments as vacation rentals, we ignored everybody’s advice to furnish ultra-modern and filled them instead with more antiques, many bought from the previous owner, whose family had lived there for many generations. Yes, the quality is amazing. Solid wood, sometimes hewn by hand. It’s all in good shape but not museum perfect, so I don’t faint over a new scratch (but I will get out coasters!). A dining table has a pedestal sporting four wild animals, each about the size of a house cat. Not the same Ikea stuff found in every other AirBnB. I had been wondering whether there was too much brown, and considered giving a few pieces a cérusé treatment. Now I can cross that off. We also have many pieces of dark wood in our house, most of them used to belong to our parents and some we have bought. You can mix any colours of wood with each other. Older pieces do have more design interest features. Brown furniture is such a derogatory phrase. I love antique furniture. I grew up going on trips to antique shops listening to my mother asking for “your best price” and being madly embarrassed about the whole thing. Of course, I now marvel at her wisdom as I too have a house filled with beautiful antique furniture – some inherited and some not. I have modern stuff too but take great delight in mixing it all up – Regency dining chairs upholstered in modern patterned fabrics look incredible. I am lucky to have a Victorian house with high ceilings so benefit from buying more cheaply the large pieces of furniture which would dwarf a modern room. I recently picked up a Georgian mahogany linen press at auction, complete with slides and original keys in very good condition for under £500. So, antique furniture is beautiful, very green, incredibly practical and something you can give to your children. Agreed, you might not want to put your hot cup of tea on a beautiful rosewood table – but it’s a question of treating these items with respect and nothing a good book can’t help out with (not a fan of coasters). Great article Kate! I’m looking forward to new wood colours after too many decades of white-washed and pale furniture. But I get the feeling that mid-century modern is getting unnecessary blame. Are we saying that dark brown furniture is back or that mid-century is over? You can have both things like the beautiful example from BRepurposed above. Never liked mid century – probably because I grew up in it. William Morris’ design advice hasn’t been bettered: have nothing in your home that is not beautiful or useful: lot of brown furniture combines both elements. If this trend continues prices will go up, but on the plus side less good quality pieces will be thrown on the tip. But does this spell the end of painted furniture? Will chalk paint become uncool? Having grown up in a house with teak furniture and pine galore, I’ve always loved the dark wood, of the furniture in my grandparents homes. Mainly the more simple we’ll loved pieces in one grandparents, than the highly glossed pieces in the other. When my in laws moved home and threw or repainted a lot of their furniture it was dissapointed. I now have the mirror from one of my grandparents, a bureau from my husbands grandparents, a side table from an antique fair and we also recently bought a barley twist, gate leg dinning table from ebay for less than the price of a chair from our old set! I love these pieces. Would really love a huge old dark wood chest of draws in our bed, to off set against the very modern white pieces we have. Love their stories, even if they aren’t all ours. Love some Victorian furniture, the library chairs inherited from my mum, the Edwardian table my dad rescued and carefully repaired and varnished. When we sold mum’s house, I guess brown furniture wasn’t a la mode, antique dealer, I think, got a great deal. Also have a couple of fab tall cane plant stand thingies. As you say, cyclical. I love old furnitures and accessories because of their known or hidden stories, and beauty and quality, too. I have bought some different old, dark brown thonet chairs for my dining room and I was really surprised how comfortable they are! They fit my pale wood, white legged IKEA dining table super well. One of these chairs has a bunch of flowers pattern on its sitting surface and my mother told me that she used to sit on an exactly same one when she was a child. Then the modernism came and they throw away all the thonets to get new, plastic ones. “Table round by the road” is such a great credit. I gave my brother in law a “bentwood coat/hat stand found under a bridge” but unfortunately that disappeared when he moved. Anyway, my best bargain was a very large, slightly foxed mirror at the tip, which found its way to my house where my husband made a frame and back for it. 20+ years later and it’s moved house but is still in daily use. I live not far from Emmaus (and Ikea). Regaular visits to Emmaus have provided me with a beautiful vintage trunk, pretty vintage Christmas decorations, eclectic jewellery. I’m now on the lookout for a small chest of “brown” drawers. They also have a coffee shop – the soup is particularly good – and a collectibles room, a veritable treasure trove. All that, and an amazing ethos. Plus it makes me realise how lucky I am. I love so called brown furniture. That’s the one taste I have inherited from my mum. I am the only one of her children who enjoyed following her and my dad around antiques fairs when I was a teenager. I have never succumbed to the midcentury trend. I just think there is something really nice about a dark well made piece of wooden furniture in a period house, against a white wall with lots of green plants. I also like the stories… I have a small bedside table that my great grand-mother used to store her sewing stuff. I never knew her but my mum loved her and I love it. I wouldn’t go for the total look though I like a bit of painted furniture and lighter wood to break it up! Hate brown wood – reminiscent of the 70’s and 80’s formica days- shudder!